On this day, November 1, 1872, England's first FIFA-recognised international football match was a 0-0 draw against Scotland at Hamilton Crescent in Partick, Glasgow. In this game, Scotland was represented by players from Glasgow's Queens Park F.C.. 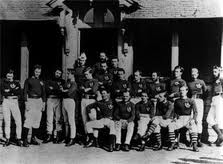 The first "official" English team was:R Barker (Hertfordshire Rangers), goal; E H Greenhalgh (Notts Club), three-quarter back; R C Welch (Harrow Chequers), half back; F Chappell (Oxford University), fly-kick; capt. Cuthbert Ottaway (Oxford University), middle; C J Chenery (Crystal Palace), middle; J C Clegg (Sheffield), middle; A S Kirke Smith (Oxford University), middle; J Brockbank (Oxford University) right side; W J Maynard (1st Surrey Rifles) left side; J F Morris (Barnes Club) left side. 1938 Before a crowd of 40,000 spectators, Seabiscuit, under jockey George Woolf, defeated odds-on favorite War Admiral in the Pimlico Special. The race was run as a winner-take-all match race with a purse of $15,000. 1944 Racing returned to Hollywood Park after a three-year hiatus, which followed the attack on Pearl Harbor. 1946 In the first Basketball Association of America game, the New York Knicks beat the Toronto Huskies 68-66 at Maple Leaf Gardens. 1950 Chuck Cooper, the first black player drafted by the National Basketball Association, played in his first game for the Boston Celtics. 1959 Montreal Canadien Jacques Plante became the first goaltender to wear a plastic mask. 1959 Jim Brown rushed for five TDs against the Colts in Cleveland's 38-31 win. 1964 Kansas City's Len Dawson passed for 435 yards and six TDs en route to a 49-39 win over the Denver Broncos. 1966 The NFL awarded an NFL franchise to New Orleans. 1996 The NBA tipped off their 50th season. 1996 The Philadelphia 76ers inaugurated their season with the opening of the CoreStates Center before 20,444, the largest crowd ever to see a basketball game in the state of Pennsylvania. The Milwaukee Bucks defeated the Sixers, 111-103. 1996 Shaquille O'Neil made his Hollywood debut as the Los Angeles Lakers defeated the Phoenix Suns, 96-82. 1996 Michelle's Jackpot won the Three Diamonds in 1:54.4 at Garden State Park in New Jersey. 1997 Nebraska head coach Tom Osborne recorded his 250th career victory with a 67-7 win over Oklahoma, the worst loss in Sooner history. 1997 North Carolina State's Torry Holt caught five touchdown passes in a 48-35 loss to Florida State. 1997 Louisiana State's Kevin Faulk rushed for 212 yards and a school record five touchdowns in a 63-28 win at Kentucky. 1998 Steve Young and Jerry Rice hooked up for their 80th career touchdown, and eclipsed the previous mark held by the tandem of Dan Marino and Mark Clayton of the Miami Dolphins, but it wasn't enough as the Green Bay Packers defeated the Niners, 36-22. 1998 Ex-Bears running back Walter Payton died from complications of liver disease. He was 45-years old. 1998 The Yankees re-signed FA OF Bernie Williams to a 7-year, $87.5 million contract. 2000 Miami Heat coach Pat Riley became the second NBA coach to win 1,000 games. 2000 The Philadelphia Phillies named Larry Bowa their new manager. 2000 The Los Angeles Dodgers promoted bench coach Jim Tracy as the team's new manager. 2001 The Houston Astros named Jimy Williams their new manager. 2002 The Minnesota Vikings finally signed their first-round draft pick, OT Bryant McKinnie out of Miami-FLA. McKinnie held out for 98 days. 2003 University of Pittsburgh wide receiver Larry Fitzgerald established a new NCAA record with a touchdown reception in his 14th straight game, as Pittsburgh defeated Boston College, 24-13. 2003 Arkansas defeated Kentucky 71-63 in seven OTs, which tied a NCAA record for longest game in college football history. 2003 John Gagliardi tied Eddie Robinson as college football's career victory leader with his 408th victory. He guided Division III St. John's to a 15-12 victory over St. Thomas. 2004 Gerry Hunsicker resigned as general manager of the Houston Astros. Tim Purpura was named the new GM of the team. 2004 Ken Caminiti, who won the National League MVP in 1996 and later admitted to using steroids during his playing career, passed away due to complications from a drug overdose. 2005 The Phillies sent Jim Thome to the White Sox for Aaron Rowand and Gio Gonzalez. 2006 Michigan State fired head football coach John L. Smith. 2006 Pitcher Guillermo Mota, who finished the 2006 season with the New York Mets, was suspended 50 games for violating Major League Baseball's drug policy. 2007 The Los Angeles Dodgers named Joe Torre their new manager. 2009 Meb Keflezighi became the first American male winner of the New York City Marathon in more than 20 years and Ethiopia's Derartu Tulu ended Paula Radcliffe's two-year reign on the women's side. 2009 Tennessee Titans RB Chris Johnson rushed for a franchise record 228 yards, during their 30-13 victory over the Jacksonville Jaguars. 2010 The San Francisco Giants won their first World Series since 1954 defeating the Texas Rangers four games to one. Giants shortstop Edgar Renteria was named World Series MVP. 2011 The Chicago Cubs named Jed Hoyer their new general manager. Birthdays Grantland Rice (1880) - American Sportswriter; Al Arbour (1932) - NHL coach; Gary Player (1936) - Golfer.